Merlin published the S Series "Prima Causa" in 1869, plate 5. Earlier, in 1859, he published it as well. Waite reviews Merlin in the Pictorial Key, so there is no doubt they knew it. Among ancient cards which are mentioned in connexion with the Tarot, there are firstly those of Baldini, which are the celebrated set attributed by tradition to Andrea Mantegna, though this view is now generally rejected. Their date is supposed to be about 1470, and it is thought that there are not more than four collections extant in Europe. A copy or reproduction referred to 1485 is perhaps equally rare. A complete set contains fifty numbers, divided into five denaries or sequences of ten cards each. There seems to be no record that they were used for the purposes of a game, whether of chance or skill; they could scarcely have lent themselves to divination or any form of fortune-telling; while it would be more than idle to impute a profound symbolical meaning to their obvious emblematic designs. The first denary embodies Conditions of Life, as follows: (i) The Beggar, (2) the Knave, (3) the Artisan, (4) the Merchant, (5) the Noble, (6) the Knight, (7) the Doge, (8) the King, (9) the Emperor, (10) the Pope. The second contains the Muses and their Divine Leader: (11) Calliope, (12) Urania, (13) Terpsichore, (14) Erato, (15) Polyhymnia, (16) Thalia, (17) Melpomene, (18) Euterpe, (19) Clio, (20) Apollo. The third combines part of the Liberal Arts and Sciences with other departments of human learning, as follows: (21) Grammar, (22) Logic, (23) Rhetoric, (24) Geometry, (25) Arithmetic, (26) Music, (27) Poetry,(28) Philosophy, (29) Astrology, (30) Theology. The fourth denary completes the Liberal Arts and enumerates the Virtues: (31) Astronomy, (32) Chronology, (33) Cosmology, (34) Temperance, (35) Prudence, (36) Strength, (37) Justice; (38) Charity, (39) Hope, (40) Faith. The fifth and last denary presents the System of the Heavens (41) Moon, (42) Mercury, (43) Venus, (44) Sun, (45) Mars, (46) Jupiter, (47) Saturn, (48) A Eighth Sphere, (49) Primum Mobile, (50) First Cause. If it be agreed that, except accidentally and sporadically, the Baldini emblematic or allegorical pictures have only a shadowy and occasional connexion with Tarot cards, and, whatever their most probable date, that they can have supplied no originating motive, it follows that we are still seeking not only an origin in place and time for the symbols with which we are concerned, but a specific case of their manifestation on the continent of Europe to serve as a point of departure, whether backward or forward. 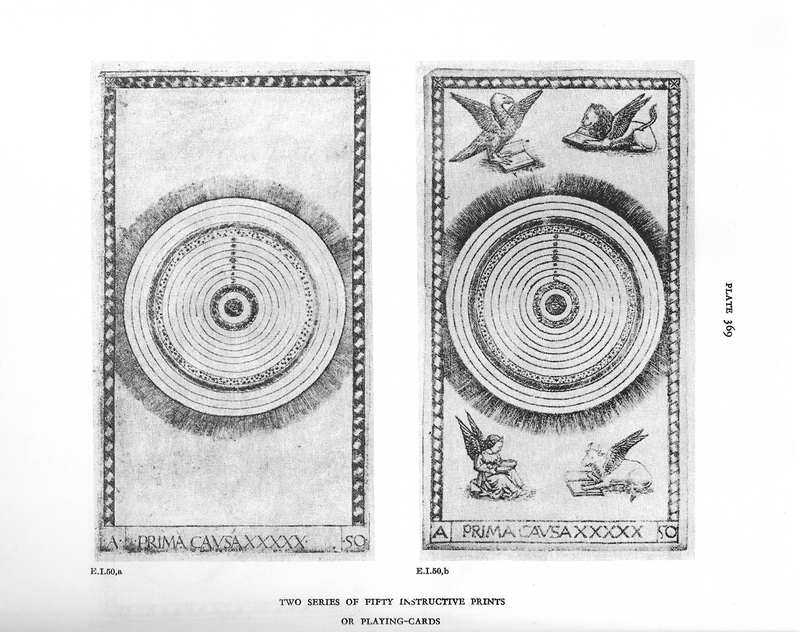 At first glance one can not see any connection between these two designs except through the symbols of the four evangelists located on one ... symbols which are not present in the engravings of 1470... but if one questions what (is the connection) with this image of concentric circles in the Figure of Prima Causa and the answer shall be that this figure of concentric circles is the world according to the Ptolemaic system ... the only one known in the fourteenth and fifteenth centuries. If one wants to point out also that the World is the final trump of the tarot as the Prima causa is the final figure of the encyclopedic series of images then one can no longer doubt that the author of tarot took the title of the World card from the figure of the Mantegna. - but I can't find the other one with all the plates in their correct places (there are a few online). Anyway, the one I attached shows how the Prima Causa could be associated with the World, as Merlin did. 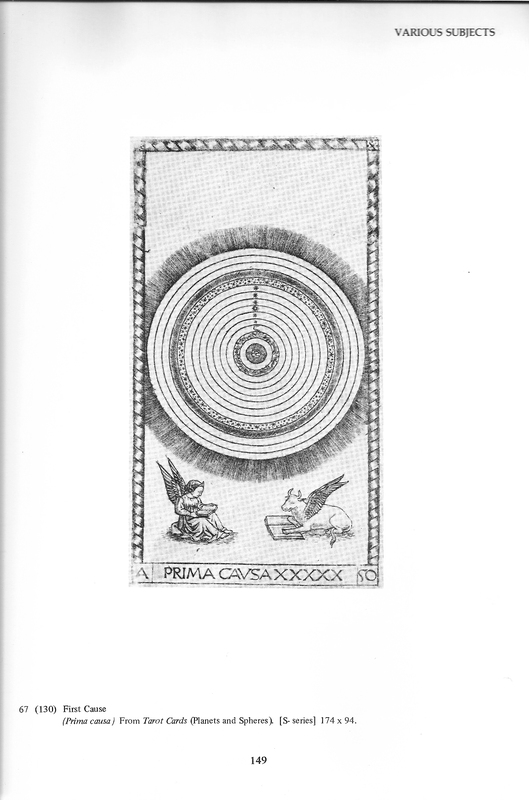 He was in fact the first person to develop the theory that the (pseudo-)Mantegna images were the basis for the Tarot. Comparing Hind's images of the E and S Series with Zucker's in The Illustrated Bartsch, shows that Hind used an S Series from Chatsworth, while Zucker used one from Vienna. The latter shows only the two bottom evangelical animals, upon which Zucker comments, "The Vienna impression illustrated in the picture atlas shows only the symbols in the lower corners, of Matthew and Luke. John's eagle and Mark's lion are missing from the upper corners since the entire section of the print has been torn aways and restored with the corresponding section of an impression of [the E Series]. An illustration taken from the complete impression in Chatsworth is herein reproduced". Zucker's Vienna image clearly shows the tear and the reparation - I'll scan it for you. I can't imagine that Merlin first used a Chatsworth in 1859 and then a Vienna for 1869, so something else is going on. Well Sumada, there it all is ! You people on this forum are amazing. Everything at your fingertips. I feel that Sumada's proposal that Pamela Coleman Smith used the 4 evangelists from the Mantegna deck has been supported here with as much evidence as we are likely to get, short of a recorded statement from her or someone of her time. Hi again Peeps ! I've found another treasure trove. This one does not contain any of the work of PCS, so far as I can tell, but it is an important survey of the art world she inhabited. A german magazine called Jugend (meaning 'youth'). This magazine gave it's name to the German word used for what we call 'Art Nouveau - 'jugendstil'. Heidelberug U. has digitized almost every issue and put it on their site. Here are some instructions - On the page linked to above, you will see a list of issues. Click on one. This will open a page for that issue with a list of text links for each page of the issue. On that page, click on the largish cover illo at upper right. This will open a webpage of thumbnails for every page of the issue on one webpage. It takes a little time to load, but not too long. Some of the thumbnails are currently not showing ( In safari I get a blue box with a question mark, meaning the image has not loaded). But if you click on them, they will open onto the full digital facsimile of the page anyway, just like the thumbnails that you can see do. I love looking at this stuff. One can really see the Fin De Siecle style in these endless pages of paintings and illustrations. I love Art Nouveau anyway. But I see constant reminders of the style of the Waite-Smith Tarot deck. The collection starts in the year 1896, which, as it turns out, was a very good year for art. This is the magic number for Art Nouveau in magazines, as far as I can tell. Looking at many other publications from the same era, It seems that before that year, things were not so Psychedelic, and harkend back more to Beaux Arts. After about 1900, things start to look less like that of Alphonse Mucha, and more like the works of Toulouse Lautrec. Called 'Post-Impressionism' on Wikipedia. Pamela Colman Smith's art seems to me to be somewhere in the middle of all this. You can also get to digitasl facsimiles of another similar mag called 'Pan" (though not as many issues). Clicking on the box with the illo in it will open an intermediary page with alot of text about the magazine. 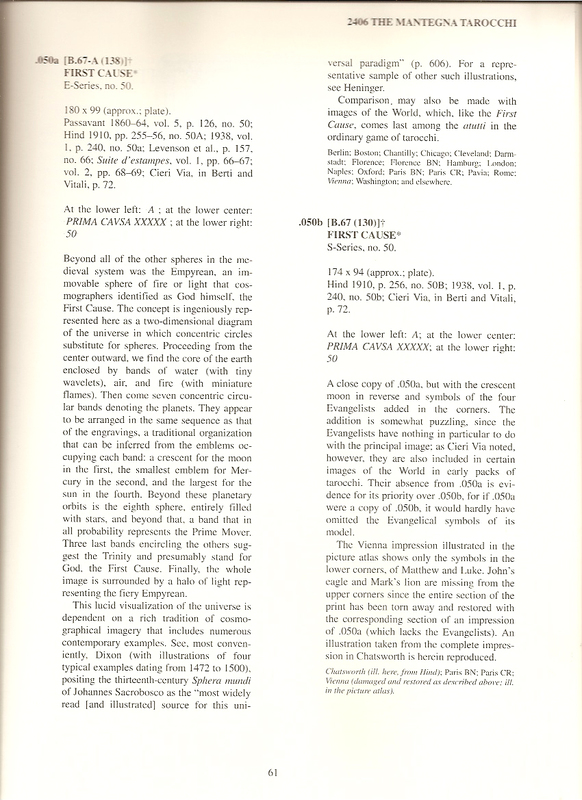 In that text you will find a text link that opens a page with a list of each issue in the same format as described above for Jugend. I recently spent an entire weekend downloading and perusing these beautiful treasures. I hope you will too. 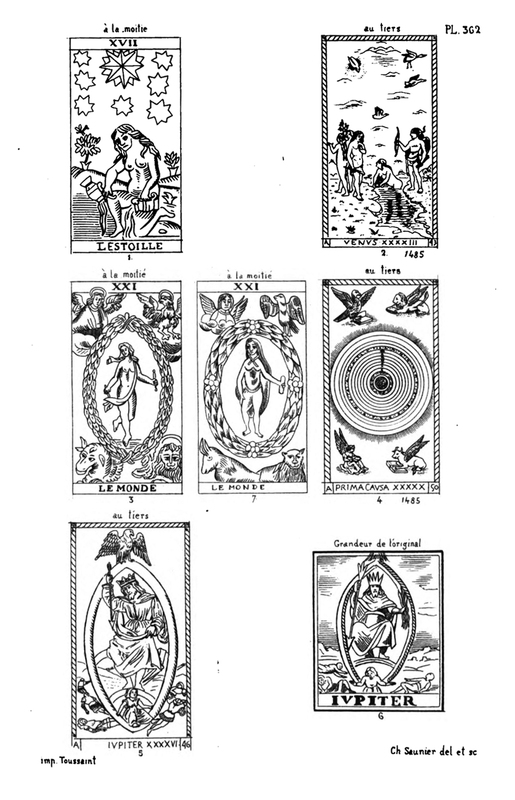 The Tarot has a modern history as well as an antique one. These magazines serve to illuminate it's international 'Bohemian' milieu. and do it quite beautifully. I've been posting a series on my blog featuring U.S. newspaper articles on Pamela Colman Smith from 1899-1914. There's lots of bits of new information and some new photos and illustrations.